FEATURES * Insulation measurement range : 200 Megohm (100V) 200 Megohm(250V) 200 Megohm(500V) 1000 Megohm(1000V) * ACV & OHM measurement. * Precision 200 ohm range easy for measuring low resistance such as motor windings, relay coils etc. 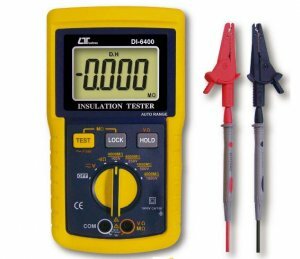 * Insulation measurement with high drive current, short circuit current > 2.55 mA. * 18 mm (0.7") large LCD display. * LSI-circuit provides high reliability and durability. * Overload protection for each range. * Automatic zero adjust & automatic circuit discharge. * Durable & portable housing case with the front protective cover.